Is the 50/100 Club Out of Reach? — The Mongrel Punt Become a Patron! Is the 50/100 Club Out of Reach? I like good tackling but despise too much tackling. In this way I think I am similar to many footy followers. The physicality of a tackle agrees with me but weekly rolling mauls definitely do not. The mowing down of an unsuspecting ball-carrier and the rigorous burying of a player who has held the pill a little too long have always been a part of footy and are invigorating to the viewer. From a young age these defensive acts are some of the zeniths of playing and watching. I remember how frustrating it was as an Under 9, not being allowed to tackle. Trying to bump an opponent when they were running next to you was irritating and probably looked hilarious to bystanders. Wet weather glue pots were once a fun sideshow to an otherwise attacking brand of football. But Moorabbin-style numbers around the ball have strategically strangled modern footy to an extent. I watched on as Ryan O’Keefe won a Norm Smith by shuffling next to Hawthorn players waiting for them to pick up the ball in his 2012 modern-scrum masterpiece. I have rewatched that match many times, and at no stage does it occur to me that Hannebery, Kennedy and Sewell are not the most influential players of that Grand Final. But 15 tackles is really racking them up, I suppose. So, we lament the extinction of kicking the ton, and the progression to hyper-tackling. Is it impossible, then, to imagine a footy fan embracing a new statistical endeavour that incorporates both disciplines? One that's never been accomplished before? No player has ever booted 50 goals and had 100 tackles in one season. The stats seem slightly arbitrary, and they are not as streamlined as milestones such as playing 300 games or kicking 100 goals. But those mountains have been climbed many times and despite the rise of small-forwards and monster midfielders who can pluck pack marks in front of goal, my statistical holy grail remains untouched. All these players have a completion rate of 80% in both categories in the one season. I’ve highlighted the ones who did complete one category but fell short of the other. Some have come unbelievably close. This is one of my favourite things about this record, elite footballers have been stalking it for over a decade but it always prevails. The 50/100 Club is so exclusive, it has no members... yet. After Dangerfield eviscerated Hawthorn’s backline on one leg in 2017, I thought the record was absolutely cooked, but he was hobbled slightly for a couple of weeks after that match and fell short of the required 50 goals. When thinking about this statistic I wondered who would be considered its pioneer. Aaron Davey is casually discussed as the pressure forward prototype and players of his ilk fill up the table of near misses. But he never really got near it, himself, with his best effort being 37 goals and 63 tackles. I admit my first thought was of Hamill at Carlton. He was a very rugged medium-forward who delighted in crushing defenders in a tackle. Really, he was a very unique player then, and his duo with Lance Whitnall is almost like the evolutionary missing link of AFL forward lines. The Hamill style of medium sized pressure forward is seen all over the league now, whereas the subtle and sluggish genius of a young Whitnall is consigned to the ammos. Sad. Anyway, Hamill is there, Blues fans! He's the very first entry too, so he can probably be considered the original candidate, until someone pulls off the 50/100 completely. But he is not really the type of player I think of (a muscular, taller forward) when I imagine a 50/100 footballer. Right now the prototype has to be Luke Breust. A small forward with a nose for goal, a very reliable tackler and is handy as an occasional clearance player who can briefly compete physically with larger midfielders. He is on the list five times, and is highlighted four times. Now, what about some cute names for this elusive mark? A double/triple or a half/whole is all I can really think of and I very much hate both. For now, I guess it is a 50/100. Who are some potential members of the 50/100 Club in 2018? Dangerfield and Ablett are both capable now that they are on the same bloody team and will be casually swapping from centre square to goal square every ten minutes. At least one of Breust and Rioli can make a comeback. 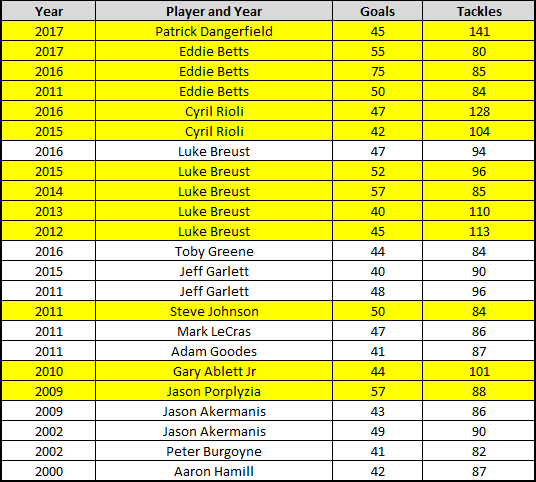 Eddie Betts will always struggle to make the 100-tackle limit I think but 50 goals are a monty. Dustin Martin and Fyfe will never play forward enough. Anthony McDonald-Tipungwuti and Tom Papley from the Swans are the darkhorses, and I am probably the only person alive who thinks Jarryd Roughead has it in him. My prediction is Toby Greene, if he can stop getting suspended (unlikely) and the Giants make a Prelim (there are concerns I think). I readily admit that the 50/100 is only relevant to the modern game and its huge tackle numbers. Tackle stats die before 1995. But that is its charm for me. It represents a tactical shift, but has somehow remained unattainable. Who will be the inaugural member of the elusive 50/100 Club? The entire football world will be watching, and waiting. Older PostThe De Goey Saga.